Is your Refrigerator not cooling? This Refrigerator repair guide will walk you through the procedure of repairing your refrigerator. This is the same procedure I go through every time I check a refrigerator. So with a little from this refrigerator repair guide your refrigerator will up and running in no time. Below is a list of problems that can cause your problem. Read through each one carefully until you find and repair your refrigerator. If you need a part You can enter your model number or part number here to search the part you need. Defrost can be the cause for your refrigerator not cooling problem. To check to see if you have a defrost problem, look in the freezer to see if there is ice build up on the evaporator cover. (The evaporator covers are either in the back of the freezer or on the bottom of the freezer). 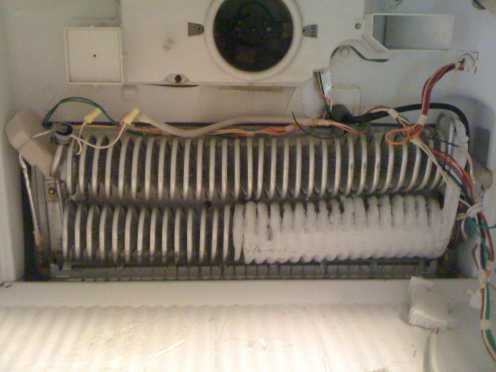 Below is a picture of what the coils will look like if there is a defrost problem. Notice how the entire coil is wrapped up with frost. If there is ice build up these pages will help. If not, keep reading on. Fans not running will cause the fresh food and the freezer sections not to work. If the condenser fan (the one under refrigerator) is not working, the compressor will cut off on the overload. If the evaporator fan is not running, there will be no airflow to the freezer or the refrigerator. First walk up to the refrigerator and listen to see if the fans (one in the freezer on one under the bottom) are running. If one is running and the other is not then get to the one that is not running and see if something is blocking it. If there is nothing blocking it then replace it. (Note that some refrigerators cut off the fan inside the freezer when you open the door so be sure that the door switch is depressed when performing this test). Refrigerator fan motors can be purchased at AppliancePartsPros.com or simply search your part above. On a top-freezer when the drain stops up water will back up turning to ice and eventually filling the air ducks with ice blocking airflow to the fresh food section causing it not to cool. You will also see a water leak inside the fresh food section. To fix this, remove the evaporator cover, (back or bottom of freezer) and then remove all the ice. Once all the ice is removed, you need to unclog the drain. I do this by forcing hot water down the drain with a turkey baser but you can use any squirt bottle, I have even used the water hose. Once the drain is clear, mix water and baking soda and pour it down the drain to prevent this from happening again anytime soon. Dirty condenser can be the cause for your refrigerator not cooling problem.. If the condenser is dirty, the compressor will cut off on the overload. (A thermostat that is on the side of the compressor that cuts it off if it overheats). Often when this happens you’ll hear a clicking noise about 2 to 3 minutes apart. This is your compressor cutting in and out as it overheats and cools off. Now you need to find out why the compressor is overheating. First you’re going to need to remove the cover from the back of the refrigerator. Once you remove the cover you should see the compressor. Now look at the condensing coils (condensing coils are going to be either behind the compressor, beside the compressor or on the back of the refrigerator) to see if they are dirty if so clean them. To clean the condenser I normally use a brush made for this. You can buy them at Wal-Mart. Once clean your problem may be fixed. Leave refrigerator unplugged for a while (20 min. or so). Then plug it back in and if the compressor doesn’t overheat problem is fixed. If it still overheats read on. The start relay can also cause the fresh food and the freezer sections not to work. 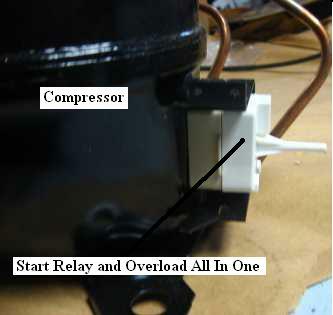 If the start relay is bad, the compressor will not start and you will hear a clicking noise in 2-5 minute intervals. The clicking noise is the overload cutting the compressor off when it overheats from trying to start with a bad start relay. To find out if this is bad first unplug the refrigerator. Then take the cover off that is on the side of the compressor. Now you should be able to see the start relay plugged on to the side of the compressor and unplug it. Now the best way to tell if it’s bad is to shake it. If it rattles, it’s bad and needs to be replaced. If not, most of the time it’s ok. But rather than saying the compressors bad, you might want to replace it anyways because it don’t cost much in most cases (less than $25). If you replace it and it doesn’t work then the compressor is bad and you’ll need you call a repairman. (Note that compressors are very costly and are normally not worth fixing). 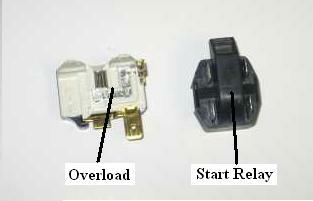 Refrigerator start relays can be purchased at AppliancePartsPros.com or simply search your part above. 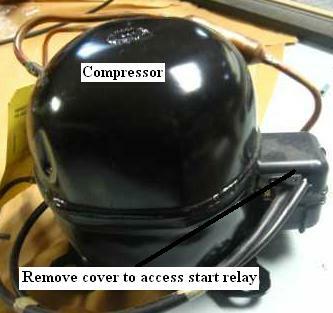 Below are pictures of common start relays on the side of a compressor I had on my shop table. If your compressor has a cover such as this one, remove it to access the relay. 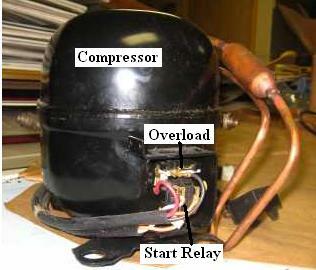 Some refrigerators use a relay-overload combination such as this one. If your refrigerator is stuck in defrost, this can be the cause for your refrigerator not cooling problem. Just simply turn the defrost timer a ¼ turn. Defrost timers are normally located in the fresh food section near the controls or at bottom behind kick plate. If the refrigerator comes on replace timer. If your refrigerator is newer, the timer may be electronic; therefore, you can’t do this. But it can still be your problem, although I haven’t seen this often. Refrigerator defrost controls can be purchased at AppliancePartsPros.com or simply search your part above. The cold control can be the cause for your refrigerator not cooling problem. This is the least likely of all the problems but happens sometimes. Turn the control up all the way and tap on it. If the refrigerator comes on then replace cold control. If it still doesn’t come on, it may still be bad. You can check it by first unplugging the refrigerator and taking the control out and test it with an. ohmmeter Unplug the wires and see if you have continuity between the terminals, if not replace control. Refrigerator cold controls can be purchased at AppliancePartsPros.com or simply search your part above. Some newer refrigerators have a main control board and this can be the cause for your refrigerator not cooling problem. This can be hard to diagnose if you don’t have a wiring diagram or don’t know how read one. I can’t help you because I would need a wiring diagram of your refrigerator to diagnose a main board. Refrigerator main boards can be purchased at AppliancePartsPros.com or simply search your part above. If you have a 2002 or newer GE-electronic-refrigerator click on one of the two links below. These two pages are for a GE refrigerator not cooling. If you still haven’t found the cause for your refrigerator not cooling then it could be a few other problems. One is that it’s a possibility you may have left the door open. If you know you didn’t do that then the door gasket may be bad but this is a stretch because it would have to be pretty bad to cause the fresh foods and freezer sections not to cool. It may be a sealed system problem in which case you’ll need to call a repairman. 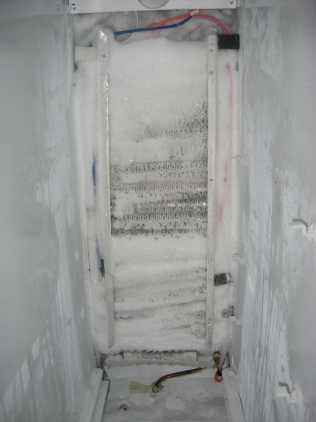 Here is an example of what the freezer coils on a refrigerator will look like if you have a refrigeration problem. Notice how the frost only comes to part of the coils this is the indication that there is a refrigeration problem. It could be low on gas; it could have a clogged capillary tube or bad compressor. These problems are not do-it-yourself repairs call a professional if the coils on your refrigerator look like this.